The Gi Bike. The Future of Urban Transport. If you've ever tried taking a bicycle on the train or subway in Japan you know what a hassle it can be. If your bicycle doesn't fold then you're required to remove both wheels, strap them to the frame, then wrangle the whole contraption into a bicycle bag. Done well its time consuming, done poorly its also dirty and there is a possibility you'll damage your bicycle, in particular the rear derailleur. 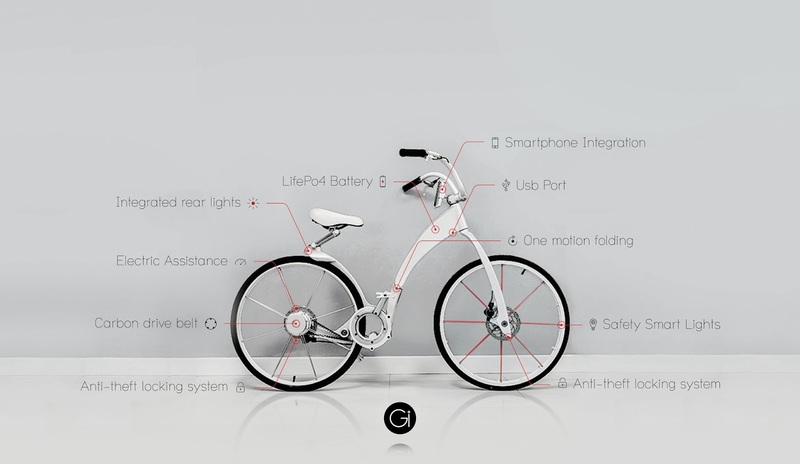 Recently I was introduced to the Gi Bike, a full sized futuristic looking bicycle that folds in just seconds and this, despite of all the other wonderful features, is why I'm intrigued by the Gi Bike project on Kickstarter. Sure it doesn't fold down to the size of an umbrella like the Sada Bike, but it is certainly more than compact enough for rail travel here in Japan and that alone makes it incredibly convenient in a city like Tokyo. Imagine riding to the station in your business suit, folding and bagging your bike for the commute then unbagging and unfolding and completing your journey by bike. With a regular bicycle that is next to impossible but with the Gi Bike it becomes reality. If your your commute is just too long by bicycle, take the Gi Bike partway by train before alighting at a convenient location and cycling remainder of the way. Imagine getting caught in the rain while cycling to work, simply head to the nearest station, fold and jump on a train. Even with the rain delay you won't be late. Manufactured from aluminium the standard model weighs just 12kg while the electric assist version is 17kg. 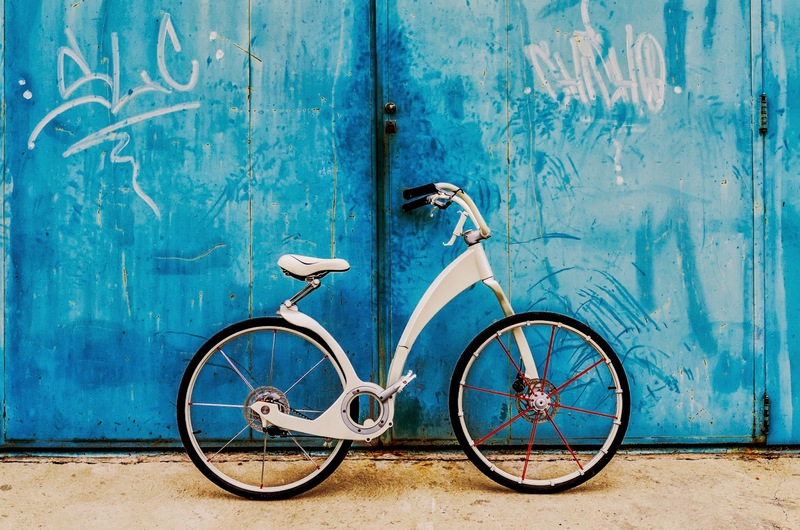 The Gi Bike features inbuilt lights (which can activate automatically in low light conditions), an electric assist option which will run up to 65km per charge, and a carbon belt drive which means you'll save on dry cleaning bills as it's oil and grease free. Using an smartphone application owners can control their lights and locking directly from their smartphone, and the bicycle will lock automatically when the owner moves just 10 feet away. The bicycle can be configured to recognise more than one owner allowing easy bike sharing among friends and family members. An inbuilt USB port allows you to recharge your phone from the bicycle's battery. But best of all, it folds easily in seconds, and doing so doesn't get the rider all dirty. As someone who has been trying to reduce the gadgetry on their bike I thought I could do without all the bells and whistles the Gi Bike offers, but the convenience of automatic lights and locking is really tempting. Regardless of the technological ingenuity it really is the quick folding operation and the carbon belt drive that I find most appealing about this bicycle and I'm sure they're features that any urban commuter would appreciate. If you'd like more information about the Gi Bike visit their Gi Bike homepage or if you'd like to get involved you can back the Gi Bike project on Kickstarter. I ride a bike friday folding tikit and love it to death. However, I was sorely disappointed by the lack of true bike friendly public transport in Japan. In Portland OR, there are always spots on the trains to hang your bike, or a couple of available spots on the rack in front of a bus, that make you feel, I dunno, welcome. Sure, I can fold my bike in Japan and put it in a bag (or use my quick cover if I'm feeling brave) and bring it on the train. But the effort it takes to do that, and the crowded nature of the trains during common commuting times, and the general lack of accommodation/welcome makes it very unappealing. I tried it a few times and gave up, opting to ride the route. I would still go to the effort if I was traveling a long way with the intent of having a good long ride at the other end, but not for a commute to work. That's just my opinion of course. Europe is kind of the same way, some countries are somewhat hostile to bikes, some less so. However, I was reading a story on the Folding Cyclist website wherein the EU bureaucracy funded a folding bike project explicitly to look into multi-modal transportation so perhaps they are waking up to the benefits of integrating bikes into the commuting process.